Well we're coming to the end of 2009, to say it's been a challenge is an understatement. Three days into the year after coming back from a much needed Christmas break our world was turned upside down thanks to a mudslide which hit the shop. Thanks to the generous support of family and friends we've been able to pull through this year and things are looking much better for 2010. I know we're not the only ones who've had a difficult year so we do feel truly blessed with all the support we've received. Many of our plans for 2009 had to be shelved and/or aborted for the time being but we still managed to do a fair amount of R&D and introduce a number of new head and intake porting programs. Probably the most exciting package which was about a year in the making was our new 340-350cfm std. pushrod location E-heads. With the amount of large cubic engines being built for true street use, a cost effective head package was in order with strong mid lift flow to allow awesome power production with moderate camshaft lift. The initial plan was really only aimed at the IA II/MR-1 larger bore blocks but after some testing of our own we realized how well this new head package with a bit of revision, worked on smaller bore OEM blocks also. With a bunch of R&D dyno testing under our belts with these new heads, we're starting to see the results speak for themselves at the track thanks to some real world testing by Ken Keefer at Ken's Speed & Machine in Florida, 9's on pump gas with a hyd. roller!!! That's the vision we had for this package and we thank Ken for some great test data with more to follow I'm sure. We're now seeing a steady flow of used E-heads rolling through the shop for these upgrades breathing a whole lot of new life into a 15 year old head design. We finally completed Marcel's 541 wideport E-headed engine, or should I say I finally let him have it after using it for 2 years of R&D testing!! LOL It was installed in the car in Sept. and only had time for a few shakedown runs with poor track prep but did manage to run 6.22 @ 110.5mph in 1/8th and close to a full pass laid down a 9.93 @ 136mph spinning off the line. This is in a 3920lbs stock interior 81 Lemans. The engine dynoed at 815hp on pump gas @ 6700rpm, 9.70's or quicker won't be a problem in 2010 with a bit of tuning and seat time. 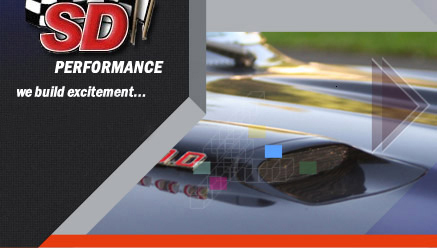 The choices for the traditional Pontiac Performance enthusiast continues to grow and SD will continue our commitment to find better and more efficient ways to get the job done. We'll be adding more head packages in 2010, everything from 62-64 389/421 packages to KRE High Port packages, our customers tell us what they want and we do our best to deliver. Everyone at SD would like to wish all our fellow Pontiac Enthusiasts a Merry Christmas and a prosperous New Year and remember supporting a Pontiac builder/vendor who loves this hobby as much as you do helps keep the hobby growing. Thank You to everyone who supports us, we truly appreciate it and without you we wouldn't be here.